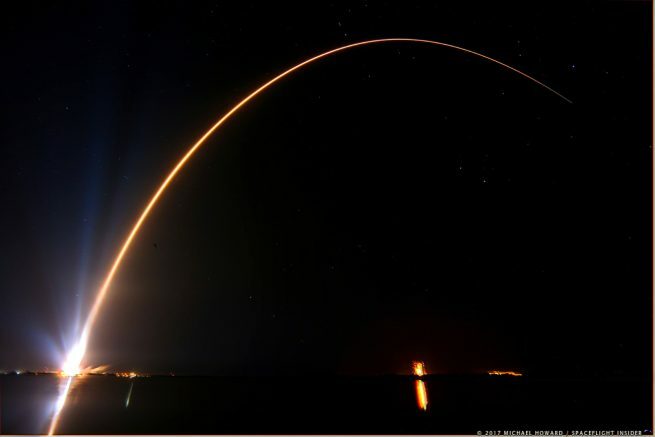 CAPE CANAVERAL, Fla. — United Launch Alliance (ULA) is celebrating the successful launch of an Atlas V rocket with the third Space Based Infrared Satellite Geosynchronous Earth Orbit (SBIRS GEO-3) satellite. It departed from Space Launch Complex 41 at 7:42 p.m. EST Jan. 20 (00:42 GMT Jan. 21). This was the second attempt to launch the rocket. The day before saw an issue with two sensors in the RD-180 engine crop up about 15 minutes before the opening of the launch window. The team used the whole window to work the issue before ultimately trying to launch at 8:26 p.m. EST Jan. 19 (01:26 GMT Jan. 20), but, alas, it wasn’t meant to be as a U.S. Customs aircraft wandered into the no-fly zone around the rocket. There was no time to reset the clock to try again that day. For the Jan. 20 attempt, which happened to also be inauguration day for the 45th president of the United States, everything in the countdown went as planned. Unlike the overcast and rainy weather in Washington, D.C., however, conditions at Cape Canaveral were almost perfect. At liftoff, the 191-foot (58.3-meter) Atlas V 401 variant (4-meter fairing, zero solid rocket motors, and a single-engine Centaur upper stage) lumbered off the pad. It cleared the tower in 12 seconds before beginning its pitch, yaw, and roll maneuvers to point the vehicle in an easterly direction. Just over a minute later, the Atlas V passed the speed of sound. The Atlas V booster stage is 12.5 feet (3.8 meters) in diameter and 106.5 feet (32.5 meters) long. Its single RD-180, consuming rocket grade kerosene (RP-1) and liquid oxygen, produced some 860,200 pounds (3,826 kilonewtons) of thrust for about 4 minutes. Once the booster stage used up its fuel, the RD-180 engine cut off and the Centaur upper stage separated. About 10 seconds later, the RL10C-1 engine ignited and continued to power toward the designated orbit. In the meantime, the payload fairing jettisoned at about 4 minutes, 27 seconds into flight. Producing about 22,900 pounds (102 kilonewtons) of thrust, the Centaur stage burned for about 11 minutes before it too cut off as planned. Now in a parking orbit, the Centaur stage and SBIRS GEO-3 spacecraft coasted for about 10 minutes before the RL10C-1 ignited once more, this time for about 3 minutes, 38 seconds. The second and final burn of the Centaur placed the spacecraft into a geostationary transfer orbit with a high point of 22,237 miles (35,787 kilometers) and a low point of 115 miles (185 kilometers). SBIRS GEO-3 separated around 43 minutes after launch and is expected to spend the next nine days fine-tuning its orbit under its own fuel and power until it reaches its final orbit at around 22,300 miles above Earth. The Air Force has not disclosed the spacecraft’s final location in geostationary orbit. The purpose of the satellite is to provide four key services to aid in national security, including missile warning, missile defense, technical intelligence, and battlespace awareness. 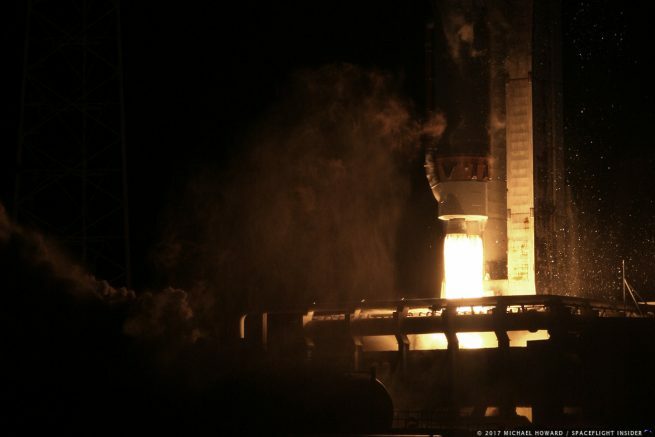 It represents the third satellite to be launched since 2011 in a series of six planned to be added to the SBIRS system. The fourth launch is currently expected to occur on Nov. 9, 2017, with the final two satellites being delivered between 2020 and 2021. The SBIRS mission team is led by the Remote Sensing Systems Directorate at the U.S. Air Force Space and Missile Systems Center at Los Angeles Air Force Base. The prime contractor for SBIRS is Lockheed Martin Space Systems of Sunnyvale, California, and Northrop Grumman Aerospace Systems of Azusa, California, is the payload integrator. The 460th Space Wing at Buckley Air Force Base, Colorado, operates the SBIRS system. This launch represents the first of 11 missions ULA expects to launch in 2017. 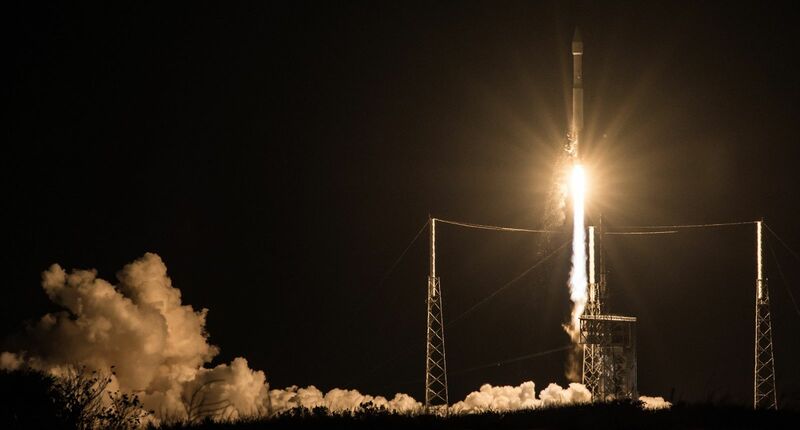 The SBIRS GEO-3 flight is one of four the company will be launching for the U.S. military and the first of seven that will be launched from Cape Canaveral. The remaining four ULA launches will be from Vandenberg Air Force Base in California.